Melanged Magic: They Did What!?
" In 1321, after a meeting in Toulouse of delegates from 60 leper colonies in the South West, the lepers decided to kill the Christians and steal their goods. The plot was uncovered, the lepers accused of having poisoned the fountains and violence ensued. At Cajarc, as elsewhere, the crowds burned them alive in their leper-house of which only the choir of the chapel remains." This is the plaque that tells about the chapel. No mention of burning people. I can see why they left that part out. Actually I can sort of see both sides here. 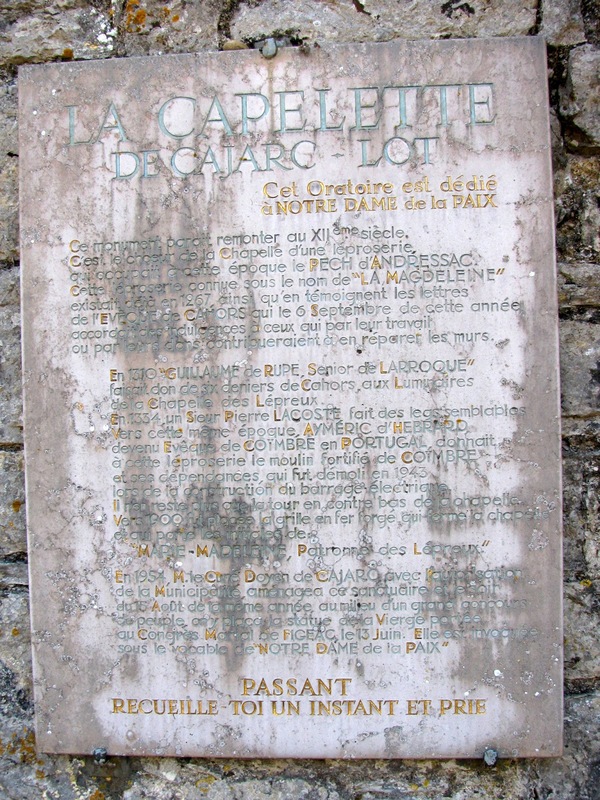 Presumably the leper colony was supported by the good Christian citizens of Cajarc, who would not have taken kindly to having their charity repaid by poisoned fountains. Given the fear of leprosy in those times, it was probably considered a good idea to burn them rather than do hand-to-hand battle. One has to be practical about these things! You know...I gave that some thought, too. Was the whole thing an example of rumors and mass hysteria. Somebody gets sick and immediately the 'outsiders' are accused of poisoning the water...very common accusation in medieval times.The other thing that puzzled me about the account was the big meeting in Toulouse...did lepers actually go there? Bet that freaked the locals out! Oh wow...we humans did some crazy things back in the day didn't we? Unfortunately, history is full of examples of man's inhumanity to man. How interesting - if grisly. There was a leper colony above Caylus, too. You have prompted me to find out more about it. I'll be interested to hear what you find out.